Mobile app only returns search results for the region I am currently in, whereas on web app I can search anywhere in the world. To/from values copy-pasted from web app return “No results found” on mobile app. Friendly and easy to use! By far best app I’ve used for urban travel on public transport. Best is that it begins knowing your location. I’m happy with this app. We used this in Paris. Absolutely wonderful for how to get places by train, metro, and on foot! This app is the best transit app I have used. Moovit easily, quickly, and accurately gets me where I need to be! Moovit is either 100% accurate with schedules and approximated arrival times or completely off schedule. No in between. Hit or miss. I‘ve tried to use it in Puerto Rico once and it only wasted my time as the information was so outdated that even the bus stops were at the wrong place! I used Moovit all day today and it was very reliable and accurate. Keep up the GREAT QUALITY SERVICE! The arrival times used to be so accurate and in the last two months something changed and now I can’t trust them at all - NOTHING is accurate. I have missed so many busses because of the app, and the electronic signs on the stations have proved to be more correct than the app. Esta APP me funciono perfectamente en Buenos Aires Argentina y ahora que estoy en Bogota Colombia igualmente PERFECTA!!! 100% RECOMENDADA!!! Within the city, this works fine. Try going further and this app is useless. Traveling from Rome to Florence is beyond its capability. How useless is that?! This app has made me miss about 3 buses now. Officially deleting it. Love the app it’s saved me at least 100 hours of travel time since I downloaded it a few months ago. The travel options currently available are excellent however my one very minor issue with the app is the lack of a most convenient route option, say fastest with least transfers and walking as some of the options that are displayed can be a little wild on the walking and/or number transfers. Still an amazing app highly recommend to everyone that has to deal with public transport. The Toto Restaurant Owner showed us application in Florence and it has been a lifesaver. No more guessing which bus to take or where the bus stop is. Moovit even gives you directions where to walk to your bus stop or destination if you don’t want to take the bus. Thanks Moovit. 1. You cannot select your current position in the map and see the GPS info or buses stopping there, without entering a To From route 2 very cumbersome to send feedback on routes and stops. Very helpful, good route information. This app works great! Plug in the addresses and it does the rest! Effective navigation app for public transportation. I really survive with this app, all my family count on it. Good use, love it. Used this for New York and it’s the best. It gives details other maps don’t like he lien going west is on other side of street for subway. Gives times m of trains. And super accurate. It’s a must! The best and easiest transportation application I have use. So easy. This happens to be one if not the best transportation Application I have use or seen. So easy and accurate. For lack of a better word it is dummy proof. I give it 5 or all the stars. Trust me I'm not that app intelligent but with this app I'm a genius. Great work guys. This app was awesome! When we were in Firenze our map apps or any other apps would not work squat, nothing worked and the city maps they’ve provided was difficult to understand. This app Moovit was so awesome! It works really well!!! We used it for Rome as well. I wish I knew of it when we were in London and France! I am giving you 4 stars but if you add buses tracking and view near station where is my location at that moment, then will be 5 stars! Accurate bus times, easy to use, the plan a trip option is really helpful. The best app for real time transit, in my opinion. I realized it's not the apps problem with predicting times of arrivals and departures. That's solely on the bus drivers who can't keep on schedule. However, the reason I gave it two stars is because my requests to have the favorite icon moved to the front has been ignored. I have to search for it every time and it is in the most inconvenient of places. Why doesn't the app open with showing my favorites on the first page not directions. I don't drive so getting directions is pointless. I'm searching for my bus arrival time not the route it takes. My wife and I used this in Rome and it was a lifesaver. We were riding the trains and buses and even switching lines like a local. This app is awesome when it comes to navigating on public transportation, but PLEASE, if I close out of the app, PLEASE DO NOT KEEP THE APP RUNNING. It’s creepy and really annoying. As I’m writing this review the app just turned back on and I have that blue bar at the top. This is the FOURTH time I had to close out of it. The Moovit app is simple to use and easy to navigate....pun intended. Used this to navigate getting around Brooklyn and Manhattan subways. Super easy and reliable. Highly recommend. The developers seem to be responsive to users needs as the app continually improves its accuracy. Now, if it could add more features, include ride share and other alternative modes of urban transportation like bird, lime, spin & metro bikes, that would make the app more indispensable. I use several different transit apps since none are adequate on their own, due to limited choices or schedules / lines that are not optimal. Displaying the actual location of the stop is helpful as you never know which side of an intersection the stop will be. Overall, as long as the developers maintain a fluid responsive app, this may be one I don't end up having to delete. We found the app quite useful and simple to use on our trip to Chicago! Works in every dang city I visit! I installed it and use it on Ljubljana, a city completely new to me. It gives me the exact bus route choices with arrival, departure, commuting times, including walking times to the bus stop. Basically it plans the trip for you for point A to B for starting now or at a future time. Amazing app and it is supposed to work in any major city. 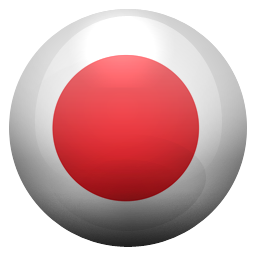 This app is great, I have used it for 2 years with good success. It literally takes you as close to your destination as possible. It it you know on your last leg of your trip how many minutes it will take to reach your destination. I find this invaluable for people who may have physical challenges walking, which I had at one point. It’s handy if all you need is the schedule but they don’t tell you how much it will cost to get there. Great App !!! Its a must if you travel a lot and bad with directions especially if you take NY transportation! Long trip to a strange place. Thank God I had this app!! Great direction and timing. I was so happy I had this app on my phone. Took me on two trains and a bus without confusion or fear!! Yay!! Works State side as well as Abroad! Life saver when I studied in France. 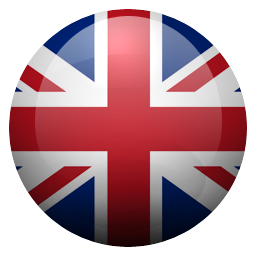 Wonderful app usable in so many cities around the world. One of rhe best travel Apps. Has become an indispensable app for travel and useful at home as well. Functions perfectly. Love this app! Just punch in where you want to go and it gives you explicit directions! Your apps bus n train arrival times are NOT WORKING! It’s always updating numbers going up n not accurate at all! This started 3 weeks ago! Before that it was ON POINT! HANDLE THAT! This app has been a lifesaver! Better than any others I could find for Greece. So helpful! Works in other countries too!! I love this app! A friend told me about it and now I use it. I was surprised to find out that i could use it when I traveled to Russia!! Made my travel so much easier and I was able to move about the city like a moscovite!! I even recommended it so my Russian friends!! Always nice and safe. Bus drivers very knowledgeable and helpful. Buses clean and comfortable. Five stars! I used the app to get directions to a place and I got there quickly and on time! I’d recommend this to everyone! I’m not lying, at first I got TheBus2 despite their review but then when I found the link to the app on their website by accident, I was honestly surprised how good the app was! It’s easy for me to navigate, I just found out that it will notify you when to get off, you can search up all the bus lines in your area, it tells you how long a walk to a stop is, and you can even call an Uber! It’s honestly amazing! I don’t see this app as social media or location revealing since at the beginning, the app does ask if you want the app to use locations all the time, sometimes, or never. But if you are a parent and are considering this app for you or your child, I would definitely get it! How would I know? This is my first year catching the bus as I am an incoming freshman! This app is so incredibly helpful! I moved to Europe for a few years and cramming in as much traveling as possible. 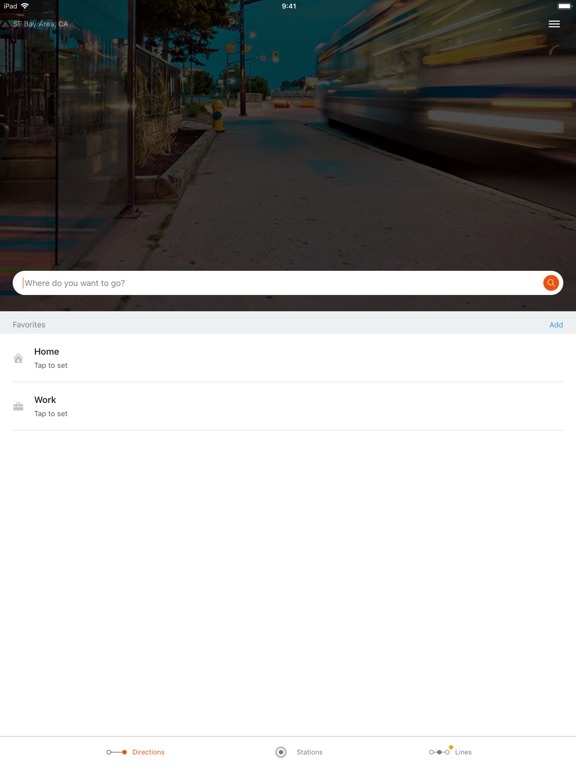 No matter where I go, moovit makes getting around the destination city a breeze. Especially bc you can pick a destination place (like a restaurant) and not have to know the nearest transportation stop name. My only annoyance is re the stations page...not all bus stops show unless you zoom in. I’d rather see them all piled up indication I should zoom then none at all. I really only use this doing advanced planning bc I like to walk a lot to explore cities. But this isn’t a big deal bc if you search a route from current location (once there), it’ll show you the nearest and fastest options. I live in Israel. This app has screwed me and my friends over too many times. It will tell you a bus is coming at a certain time and then it just never shows up. Then, you look for another route and it tells you that the exact same bus is coming in 10 minutes instead- which it doesn’t. Today I had to walk 2 km to get to another stop because it was the only available route after I wasted 15 minutes waiting for a bus that never came. After I got off that bus I had a connection bus to take me to my final destination, but surprisingly enough that bus also never came. I ended up getting to my destination a few hours late due to factors that were not even in my control. I do have to give this app some credit because it works most of the time, but I can’t even remember how many times it screwed me over. Makes life with public transportation a dream! When I got totally fed up with traffic and parking in Jerusalem I decided to try public transportation. After missing the bus several times because it arrived (and departed) earlier than scheduled, I decided to give moovit a try. At first I only used it to take the bus from my rural community to the city. On days I had to get around to several places in the city I still took my car. Sine realizing the convenience of knowing exactly how to take buses correctly and efficiently in the city, I never take my car anymore. I save aggravation and money and get to feel that I’m part of the solution instead of the problem. I use it now all over the world. This app used to be great. A few changes have occurred the last few months that have made it extremely frustrating. Before, I could load previous trips from the home screen. This meant not only the two locations I was traveling between, but the time at which I had searched for the trip. This was extremely useful because if the app closed, I could reload the trip at the push of a button, and know exactly where I was on the route and when I needed to get off. The second thing that changed is that the app crashes very frequently in the background. When I’m traveling and have to reload the route, I now have to wait until I get on a stop so that the app can show me the bus I’m currently on. This can get extremely frustrating when I’m traveling on routes I’m not used to. In addition, when I have Live Directions set, the app still crashes in the background! I just had it happen and that got me to write this review. It’s so frustrating that the app crashes a lot and I can’t reload entire trips from the home page. Just adding that one functionality back into the app would make a huge change in performance and usability of the app. Can the developers explain why they got rid of it? 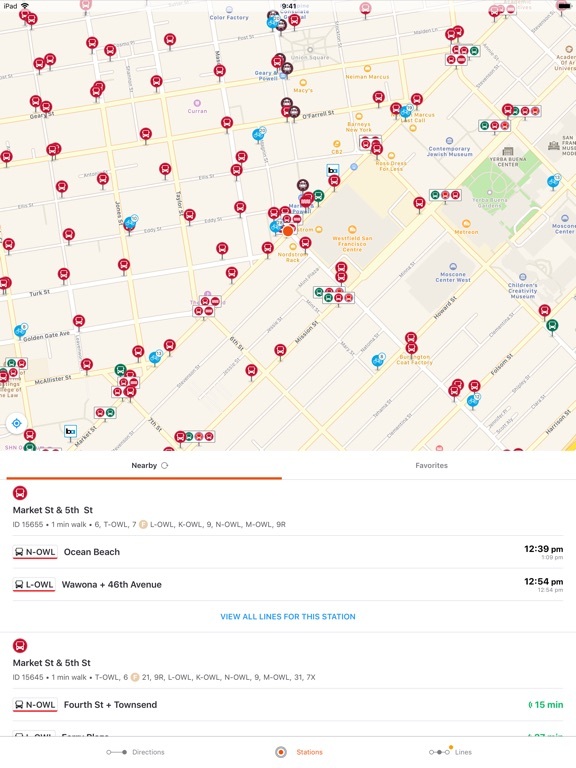 I have primarily used Moovit with AC Transit in Berkeley and Oakland, and the app has been very unreliable regardless of the line, time of day, or day of the week. It usually doesn’t get the arrival times right. I made the mistake of not checking nextbus today, and now I will be standing at a bus stop for the next half hour because Moovit didn’t take into full account tracked buses and the unreliability of bus schedules. I downloaded the app with the hopes of having an alternative to nextbus, but unfortunately was disappointed. The only redeeming quality of the app is the fact that the app provides you with notifications as to when you should prepare to get on or off your bus. However, even this is flawed, as arrival notifications are usually given after the bus has already departed. I can only hope that the developers improve the most fundamental aspects of their app. It's great that Moovit is available in my city (Christchurch NZ) and it's pretty accurate, but not down-to-the minute exact--not that I would hold a 3rd party app to that standard. Best feature: live ride/get off alerts. It is worth having the app solely for this feature. Now I don't have to stare out the window on my whole bus commute; the app tells me when my stop is coming up. The next most useful features for me are the trip planner, and being able to see which transit stops/lines are nearby. Helps me quickly figure out how to get somewhere. I have been able to use it in every urban area I've traveled to so far. Very handy how it switches automatically to a new transit area while keeping all my favorites/saved places for each area separately. Excellent tool for people who travel to different cities. When I used it in NYC, I was very glad not to have to read all the confusing subway schedules at the stations! Thanks Moovit Small quibbles: -Sometimes it isn't clear when I'm currently in "trip" mode. -It isn't super clear how to add favorite locations, stops, and lines. 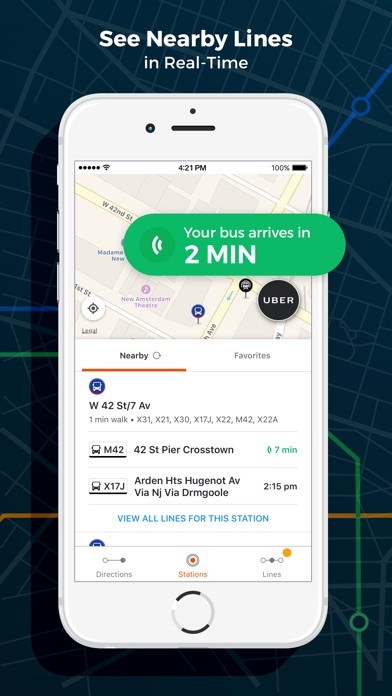 I have been searching for an app that would give me EVERYTHING in one from bus routes, directions, driving routes, Para-Transit Taxi Services, Taxi, Uber, traffic, accidents, etc etc etc all in REAL-TIME! REAL-TIME Is so important when traveling, especially when riding the bus. They give you options right then, no second guessing. THANK YOU!!! My family (grandson) seems to think that I know EVERYTHING! Like I know ALL the bus routes and schedules. So I had him download this app so he could use it and stop asking me. So THANK YOU Developers for creating an app that is easy to use and multi functional!!!! PS: It also has the 👮🏽‍♀️ alerts added in for all you speeders! I really do like the app and all it has to offer, it’s just one little thing which is that the NYC area when you go to click on a train line headed in any direction it won’t give you the list of times the train comes to specific stop like how it use to when you would click on the train lines direction your headed in it will just pull up a list of all the stations stops for that trains line/that train lines stops and not the list times for the trains that run and operate in, out of, and from that one specific train station your picking/choosing the train line you need. If I’m not mistake the app also does this for the bus lines as well. I had a trip to Rome Italy, but did not want to pay Taxi or Uber fees to get around the city. I wanted to use the public transportation (bus, tram, metro, etc) to get around Rome. Looked at maps but they were very confusing. During an internet search I came across this app (a few days after arriving Rome). Brilliant app, showed me how to get from one point to another in Rome using buses, metro, trams, local trains, even showing the stops in between, real time tracking at what point of the route you are, etc. And the same is possible in most parts and major cities of the world. Love this app, saved me so much taxi fare already. Essential if you live in NYC. I live in NYC and working late nights and having to find a way to get home is almost impossible. This app, however, gives me a direction to go and also says when a bus/subway is going to arrive on realtime. It’s usually accurate and saves me the headache of having to find out when the train will ever arrive. The only issue is that sometimes the traintime will say that the train is coming “Now,” but then it won’t arrive for another 4 minutes. But other than that, it’s an essential tool for getting around the city on the unreliable transportation system. Best for the daily commuter! I live in the Bay Area and I drive, take a train, and then a bus to get to work everyday. I don’t think I could do my commute without Moovit. The times are accurate, I check the live updates often during my commute and know if I have to run to make it or I have time to get a coffee. The only part I don’t like is you cannot manually update your route, for instance I prefer to take the bus from one stop further down than it suggests and there’s no way to update it so I have to leave my directions and look at that individual bus stops live updates. I’ve been using this app around the time that I had an iPhone 5s! Back then it wasn’t so great but now I use this app every single day. Granted there are times it doesn’t calculate the arrival appropriately but 98% of the time this app is accurate! Thank you, I don’t know that there are any other great apps, I love the layout and ease of use! I also have changed jobs a few times and have used this app to discover new ways to get to work and around the city of boston! Please don’t change! Keep doing what you’re doing as I recommend to everyone I know! I use this app in Madrid and it is INCREDIBLY accurate, it's great. Nonetheless, I have noted that sometimes the location on the map is a little too off, so finding buss stops on time can be challenging, also, in downtown and most of Madrid Center it keeps count of the minutes of each bus, but when you leave the center and go to perhaps Aranjuez, that is a community south of Madrid, it doesn't keep count anymore. So that's also something to consider, it does tell you the bus's schedule, but it won't tell you if they are delayed like it does in Madrid Center. Overall it's a great app. I’m a newly graduated High School student. That said, I had no idea how to get around without my mom telling me. I recently landed an internship 1 1/2 hours away from my house and man I gotta tell you this app has saved my life over and over again. I’ve now been using this app for about 3 months and don’t think I’ll ever download another bus app again. I really hope this app doesn’t become one of those apps where they try to fix it and end up making it worse. but for now 100% recommend. This is the app I’ve used the most since moving to San Diego. I have a job with rotating shifts and different start times, so planning ahead for what bus and trolley to get is important, and this app truly has saved my life and made getting around soooo much easier! It’s also easy to use and understand and I love that it has the route schedules for all the buses and trolleys. And the live directions have helped me ensure getting off on the correct stops too! Thanks for existing! Currently abroad and was told this is a great app for getting around, and it has been. The app provides detailed routes to get you around and has an incredible carpool feature in a country where affordable rides are hard to find. It’s precision in terms of where things are located can be off at times and I ran into a problem with trying to find a bus stop recently. Overall, this is a great app but I hope the developers will continue to improve it. This is my first review of an app and I’m writing this because this app has literally transformed the way I view public transportation. My girlfriend and I are using the app on our trip to Melbourne and Sydney and it makes getting around a snap. Just type in where you want to go and it tells you the available lines and how soon the bus and train will arrive. It has made our vacation stress free when using public transportation. I can’t recommend it enough. Thank you Moovit!! I am in Israel and this thing knows I am an English speaker but it gives me partial directions in English with the street names in Hebrew. So I know I can catch the bus, and the number of the bus to get where I want to go, but it indicates the location of the bus stop in Hebrew, which I can't read. Most street signs here are in Hebrew, Arabic, and English. So finding the English street name would not be difficult. Even the map they post has the street names in English. It is just the street names in the directions that are iffy. Also, I can put in where I want to go in English and it converts it to Hebrew when it gives the directions so I never know for sure that I am getting directions to the correct location. Prior to using this software, I used to lose valuable time everyday. Especially my line is unpredictable and run each 30 minutes. I had occasions to wait for almost an hour or if not to walk a distance to connect to another frequent line. This software seems working and even making miracles. Tracking buses to my benefit. I reduced wast time to practically none. From my experience, it is great. If some areas need polishing, I am sure updates would resolve them. Far better than RATP’s own app. For example, when looking for a particular museum I typed in musee and a list of around 20 Paris museums popped up. It also has a select from map. Knowing more or less where it is located, I found Notre Dame, selected it and the routing info popped up. 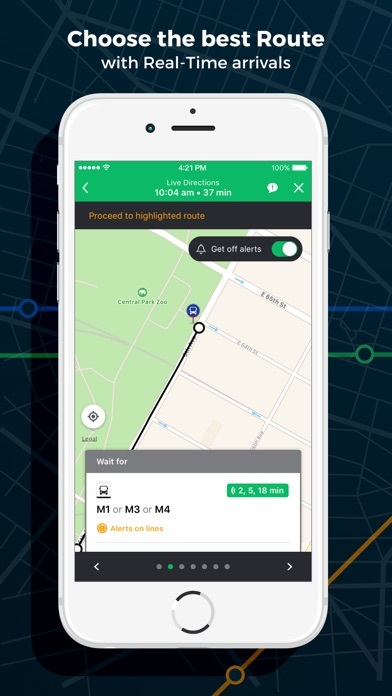 Provides choices of Metro, bus, bicycle routes & (I haven’t tried this) a connection to Uber. Also provides bus schedule if wanted. This is the BEST getting around Paris by bus, metro or combination I have found so far! If it were JUST the times not being 100% accurate, I could give this app a pass and it would earn at least 4 stars. However, I have been finding that it simply doesn’t find addresses I plug in, or when I plug them in, THANK GD I check the route because it was going to take me to a different place DESPITE me triple checking that I plugged in information correctly. Sad. What gives. I’d still recommend the app to people with a word of caution as an alternative to Google maps; but Moovit is definitely not infallible. definitely. Best public transit app there is. I live in Boston so taking the bus/train is an everyday occurrence for me. This app is very easy to use, has real time arrival (which is correct most of the time) and works in other cities as well! The New York transit was also easy to navigate and it prompted me automatically to switch to New York transit. I look forward to updates and tell all my friends to download it because I don't want the developers to stop what they are doing! This app is good for when you are traveling on the bus , ferry, or the train . Just make sure your phone is charged to know where you are going . It tells you what time you will get to your destination and how many minutes . This app shows you what bus stop to go to and which bus stop to walk to . 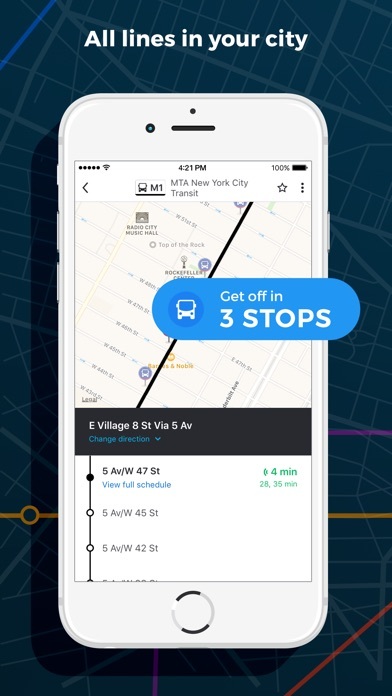 This app tells you what stops the bus will be stopping at and when to get off of the bus . I consider using . It works really good for buses . Great app! Used it everyday! I lived in Ecuador for a couple of months and this app was a LIFE SAVER! I was so nervous to take public transportation because I didn’t know how to get anywhere, but this app made it so easy. I used it basically everyday. Sometimes it was a little off by a couple of ft and there was a time when in Ecuador they decided to update some bus routes and Moovit was a bit slow to get to the program, but nonetheless it’s one of the best apps I’ve used. I use this app regularly to get to my destinations, and I’ve never had any major issues or complications with it. It’s easy to use and understand. My only complaint (which is extremely minor) is the fact that the app doesn’t account for traffic well, so when it comes to transferring buses, I would just make sure to plan ahead and leave earlier than needed in case buses are early/late. While other transport apps might do a more “thorough” job focusing on a limited number of available cities, Moovit is the hands down winner when it comes to the sheer amount of areas covered: 700 cities worldwide vs Citymapper’s 30. I’m currently in a small resort town on the east coast of Italy. No info available via CM (only covers Rome and Milan) OR Google. Moovit has accurate LOCAL bus info and it isn’t even near a major city. For that reason alone it gets my vote!! Terrific app!!! 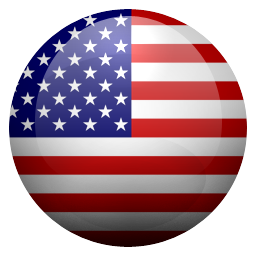 Makes me (appear to be) an expert in navigating international cities “Terrific app!!! Makes me (appear to be) an expert in navigating international cities” is the text that shows up automatically when making a comment, but this is really the truth. As long as I have this app, I nvr feel lost, and in fact feel confident in my ability to get around. Better than google maps even in my opinion. Keep it up!! I recently started using this app for car pooling to work, it helped me locate neighbors of mine that work in the same area that I’m working and I’m carpooling with them ever since.. it’s as if I’m getting a taxi to work every day! Who wouldn’t give up driving in heavy traffic every morning?!.. and it also does all the gas pricing calculations and transaction free of charge, and it turns out it is incredibly cheap, same price as the bus. The best app I have found to navigate through the DC metro area on the metro and buses. Very easy to use, just put in ur destination and the app gives you the best routes available by foot bike metro and bus. Even gives turn by turn directions. I wasn’t familiar with using the Fairfax connector bus system but this app made it so easy. Even gives live updates on buses arriving and being late. No problems with app crashing. 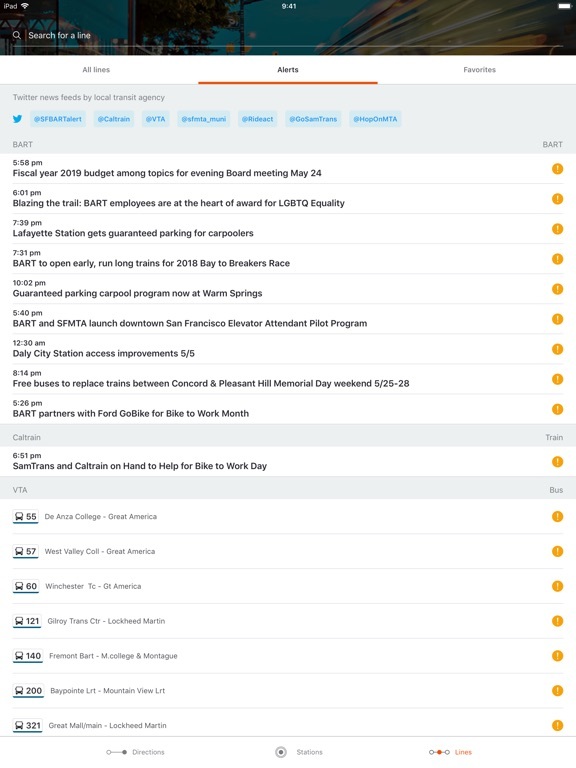 This is a great interface for schedules and expected times. That’s what I use it most because my city-provided system is occasionally wonky, and multiple sources are always a good thing. Actual point-to-point planning can be... odd. It likes to take me to ways that aren’t even vaguely the “best” way, there isn’t apparently to plan by your own route, and the times in a series are confusing. But if you already know your town... it’s useful. I use this app everyday, it is very helpful! However, I think there should be a “night mode” and a “day mode” similar to Twitter because the app is too bright. The screen is mostly white and there are no options to change it. Night mode would make the screen less bright and it would be much better to have more options in regards to how the screen is set up, whether people prefer the screen dark or white. This app is great to check the schedules when the bus is on schedule. It has been countless times recently that I try checking if I’m going to make it in time to change buses and either it goes from me thinking I have plenty of time and having to wait for the next one 30min later or app saying I’m not going to make it and bus shows up like 10min late when I’m in a nearby place grabbing a bottle of water or after calling uber. Though it gives us the feeling that it’s constantly updating it’s the least accurate app of the sort I’ve ever interacted with. Moovit is the app to use in Singapore for me! It gives me all the routes available, then I can choose which one suits my needs. The greatest thing is that it gives me little chimes and a final alert when it is time for me to get off on my stop. So many times I would’ve missed my stop because the buses don’t stop at every bus interchange so you cannot count how many, therefore I missed my stop before using Moovit! Honestly my biggest and possibly only complaint is that this app assumes that if I’m not taking public transportation, then I’m walking. Guess what - I actually do drive the 10 miles or so between the BART station and my house! If I’m feeling energetic, I might ride my bike - neither of these is accounted for. Simply letting me set the non-public-transport parts of my route to something other than walking would make this app much better. I moved here for nursing school from Sac area and I love using he transportation system here. Very easy and convenient to use app. It’s reliable and on time pretty much most of the time. Won’t work when going through tunnels but once you ride it a few times, you’ll know how it works and use it less, unless if it’s to check the times when the train/bus arrives. This app has simplified my commute to and from work. I used to hate riding the bus and metro before this app because I felt I always needed to be watching each stop carefully. No matter where I come from I always have multiple travel options and feel confident using public transportation. 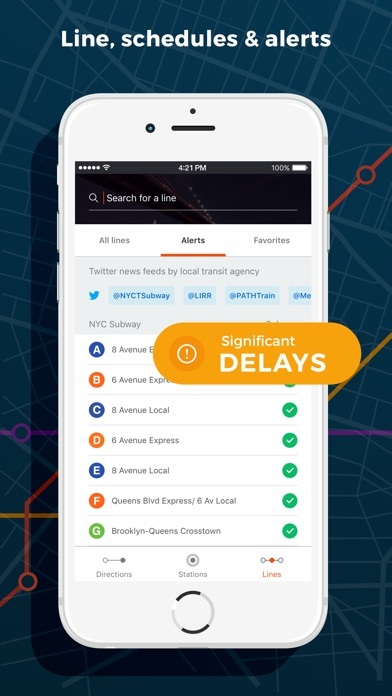 When there’s delays, changes, or new routes I can always count on Moovit. Thank you!! “Transit”s interface might be known for it’s playfulness but as a user I have always felt anxious using it, because when I’m waiting for a metro to arrive I don’t care about its playfulness or beauty, the only thing I care about is the straightforwardness. “Moovit” interface is cleaner and faster compared to “Transit” and is similar to the app “Citymapper”, but only on steroids. So “Moovit” is the best as it can get. For me this app is an unbelievable time saver. I visit NYC often and being able to map out where I want to go on foot and subway saves an enormous amount of time! It is extremely user friendly and the fact that you can select the mode of transportation that you are comfortable with is great. This app by far is one of the most useful I have ever downloaded. Love this app, it helps you a lot. You can quickly find directions by using the different types of transports. It shows you all the pickups hours and guides you very well as you’re moving. The only inconvenient: if you don’t “start live directions” before getting in a transport, the app isn’t always following you. Ex: It sometimes tells you that you’ve got to get in the next metro whereas you’re already in a metro. Best transit app out there! This app is amazing, it helped me feel comfortable enough to travel around NYC, and Paris without hesitation. I would never have used either metro system without this app, we would have uber’d and used taxi’s which would have broken the bank. Using the metro is so inexpensive and with this app it was hassle free also. I can’t wait to use it again when I travel. I’m new to this app and only use mass transit intermittently. (Historically I used transit daily, before smartphones and relied on paper schedules.) This app is a must since I’m not that familiar with local schedules and routes anymore. I’m still learning its many features but find it intuitive and easy to use. This app will encourage me to to use mass transit. Thanks for making such a sophisticated and reliable app. I was using Google Maps for most of the time but realized it can’t find bus route. Moovit solves the problem! This app can show bus route and works way better in Paris, France. Can show expected time of arrival as well. I would recommend using them especially in Paris. I didn’t have chance to try this in other countries, will try in next travel. Cittati Tecnologia em Desenvolvimento de Solucoes Ltda.